There was a more innocent time, several generations ago, when masked crime fighters took on young sidekicks. It painted a rather non-lethal picture of super-heroes. No big deal when the bad guys were inept henchman of a greater criminal. But then there came the age of the grim ‘n gritty, where heroes and villains – and sidekicks – died. As the genre progresses, kid sidekicks have fallen out of favor. So why on Earth would Batman Beyond take on a Robin Beyond? Good question. But as we all know in the world of comic books, nothing is permanent, including a teenager putting on a mask and fighting crime alongside an older mentor. Mother of mercy, is this the end of Robin Beyond? Let us hope so, otherwise the annoying little punk is going to be the subject of another 1-800-kill-your-sidekick program. 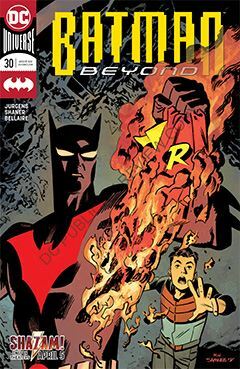 The current issue of Batman Beyond is an epilogue for the recent Final Joke story arc. The Joker has been resurrected, battled and defeated for the last time, but there is fall-out in the form of Matt McGinnis’ PTSD. One doesn’t stare into the face of evil – or in this case, the Joker – and come away unscathed. Doc Shaner provides the art, and is the latest stellar talent to contribute to the title. Unfortunately, they don’t seem to last. My favorites tend to last only a handful of issues before moving on to other projects. I’d really like it if Doc hangs around a bit longer than usual.